Perhaps he’s playing the last post? I forgot to take his picture before I took the finished piece off the frame, which is why he’s a little wrinkly, but it didn’t seem fair to deny him his moment in the spotlight. It’s easy to spend a lot of time thinking about the things we would like to have, or the things we want to make. It’s kind of a status symbol these days in historical recreation when we can brag about a huge project list, and we like to compare wishlists with others. I’ve certainly done my fair share of that. It seems like we’re constantly asking the question: What’s the next thing that I’m going to spend my time, energy and money on? Everyone tried a bit of everything, basic laid and couched, trellis couching, and a bit of trailed couching as well, with some lovely results. 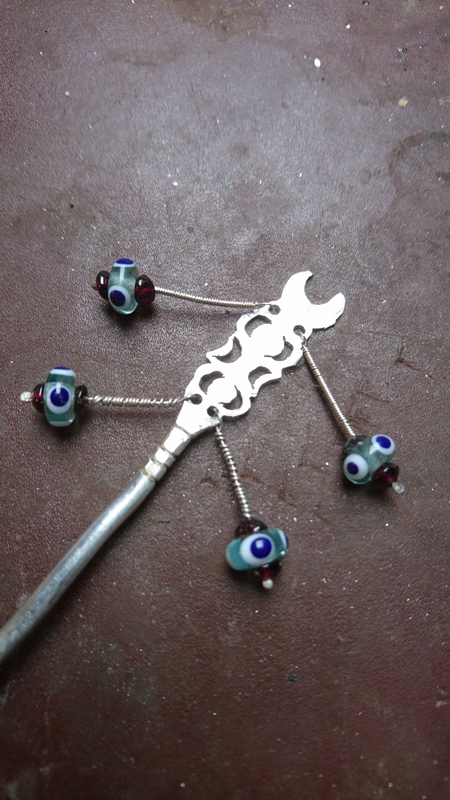 And in other news I made myself a new roman hairpin, identical to the one I just lost – for alas such is the fate of hairpins. I’m particularly fond of this design, despite the danglies that knot into my hair, becuase it makes an interesting talking point as the crescent moons are oft interpreted as evidence for the cult if Isis having reached Britannia. 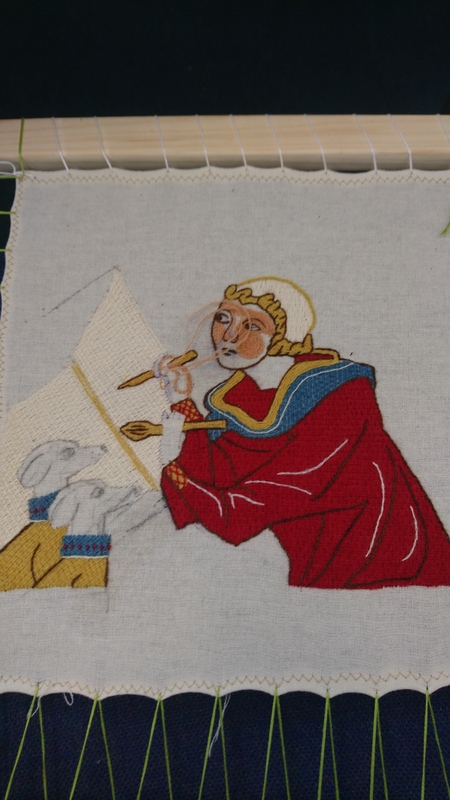 When I was researching medieval cope shields for my latest goldwork project 'On the shores of St. Nick', I saw that many had some kind of architectural frame going around the scene. I wanted one too! So I picked the one from a cope shield showing Abigail and David made around 1520-1530 in the Northern Netherlands. The piece is kept at the Catherijne Convent in the Netherlands and can be viewed in great detail online (click the image and watch 16 additional pictures which you can enlarge as well!). 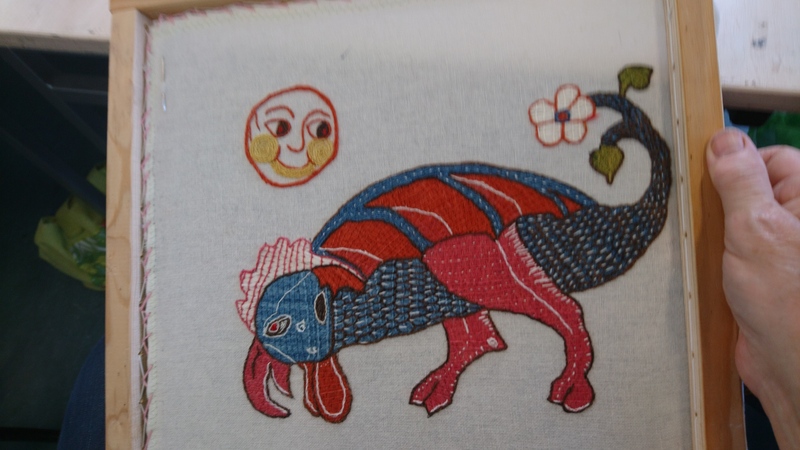 The pictures below come from this fantastic online catalogue. Cope shield (c. 1520-1530) showing Abigail and David from the collection of the Catharijne Convent, Netherlands. It is a beautiful and ornate piece. But when you really start to look at it, you will find some curiosities. Look for instance at the innermost columns (those with the spiral going around). Notice anything amiss? The base of the column is behind the outermost column, but the capital is in front of it!!! Turns out M.C. Escher wasn't that original :). A similar thing can be seen in the piece of St. Lawrence: the floor tiles in the original are completely wrong perspective-wise. 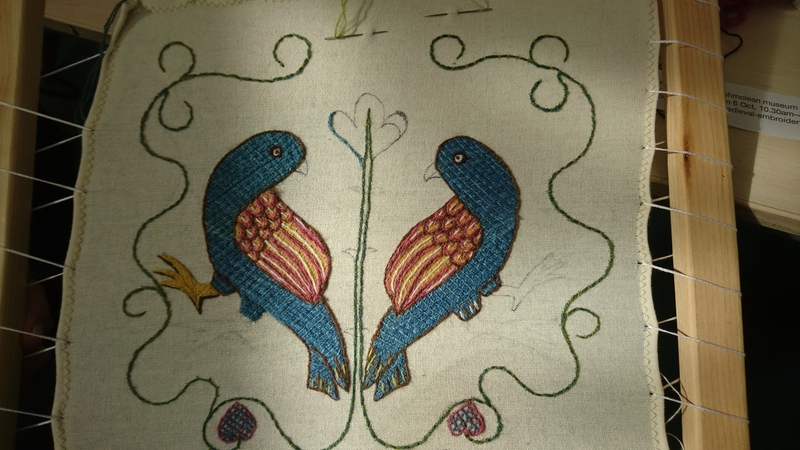 Why did the late-medieval embroidery designers make these mistakes? Well, the Renaissance had only started in Italy roughly a century before this piece was made. Interestingly, early Netherlandish art (1425-1525) developed independently from the movement in Italy. Wikipedia says: "The Netherlandish painters did not approach the creation of a picture through a framework of linear perspective and correct proportion. They maintained a medieval view of hierarchical proportion and religious symbolism, while delighting in a realistic treatment of material elements, both natural and man-made." And that's exactly what we see here. But that`s not all! 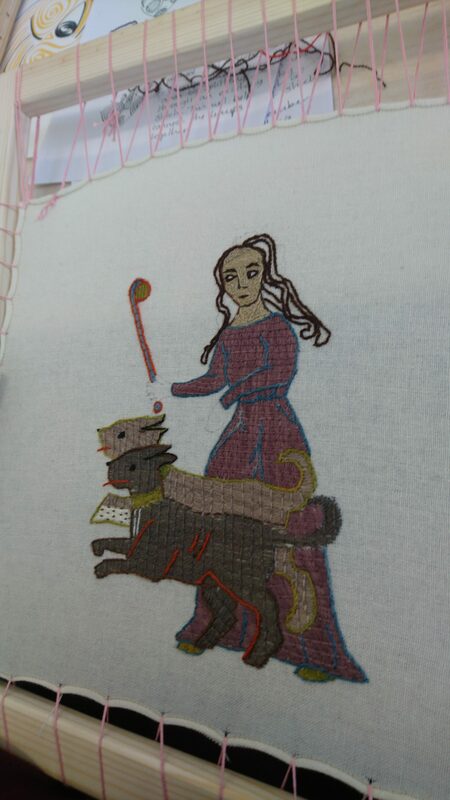 The average medieval embroiderer was clearly not aiming for 'distinction' at the Regiis schola opere plumarii. 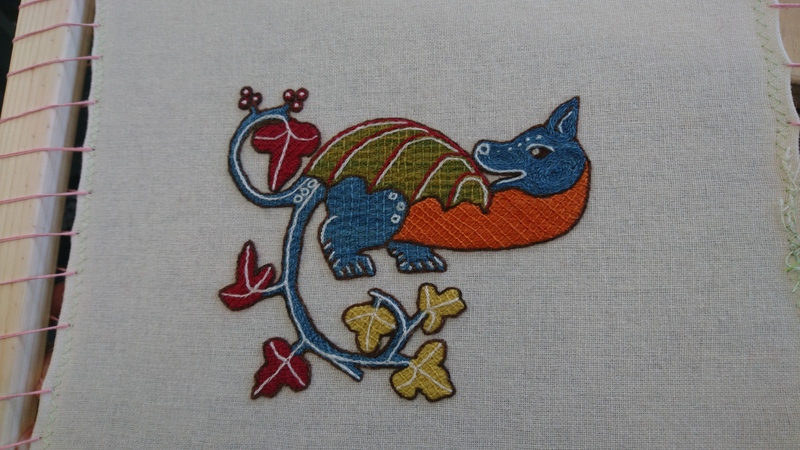 Yup, that's Royal School of Needlework in Latin according to Google translate :). In this case, there are some issues with the padding. I've marked them with white in the picture on the right. Can you see the problem? 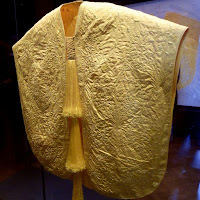 The string padding runs in the same direction as the couched gold threads should run. That doesn't work at all. Imagine trying to couch down a round goldwork thread on top of a round piece of string? They will always try to get away from each other and roll. The solution? Fudge as you go. But it doesn't really work. Quite a lot of the definition is lost and it looks messy. But in a world with dark churches and only candlelight, it didn't matter. As long as it sparkled to the greater glory of God and the wearer, it was okay. P.S. Note that the original background drawing was different and more ornate? 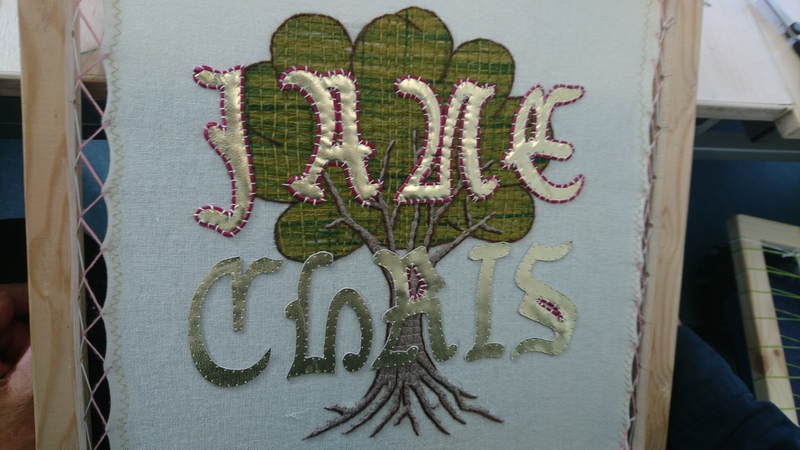 I love the fact that the embroiderer had a degree of freedom in stitching the design! Unfortunately for me, I did attend the Regiis schola opere plumarii (sorry, but I now like it better than the English name). I already sorted out the mess underneath St. Lawrence's arm and I intend on sorting out this mess too. But it is a slow process. Especially as things are perspectively wrong, I really need to think a lot first, before I couch down any gold. The plan is to lay the gold in the direction of the architecture, instead of working strictly vertical. The above is the result so far. 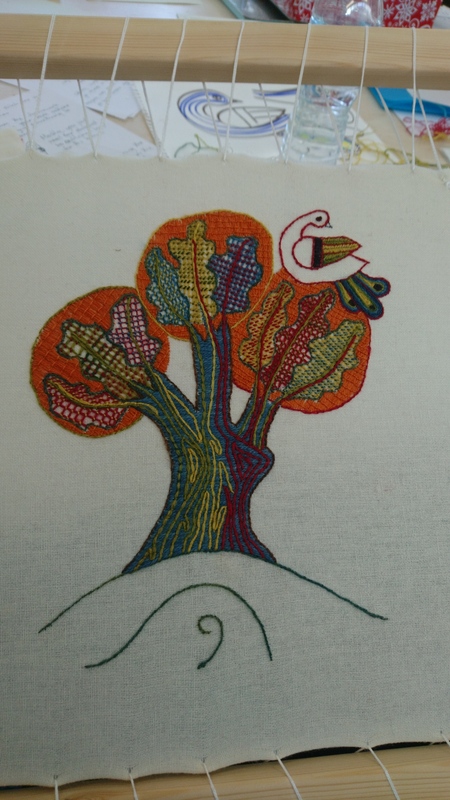 I am using House of Embroidery fine silk colour Forget me Not in a condensed Scotch stitch for the sky. The Japanese thread #8 is couched down with DeVere Yarns 6-fold silk colour Allspice. I really like how well this warm brown colour combines with the gold! Victoria and Albert Museum (June 2012). (photo: Cmglee, on Wikimedia Commons)..
Unsurprisingly (given my irregular habits), I missed the actual date, but on March 16, 2019, this blog was exactly 10 years old. A decade is a long time. 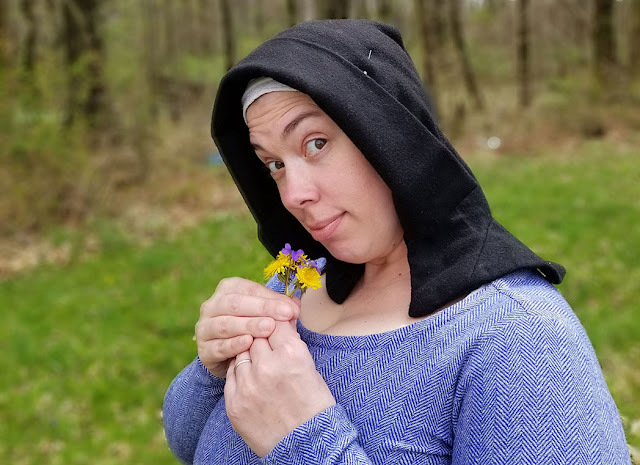 In the 10 years since I started this blog, I've seen many costuming blogs fall by the wayside, lost to family obligations, changes in health, changes in priorities, and the rise of other forms of social media, such as Instagram and Facebook. Other Internet communities of historical costumers, including the MedCos list and the Norsefolk and Norsefolk_2 mailing lists on Yahoo!, are defunct, and the h-cost list, though still technically active, sees very little activity now. On the other hand, Instagram and Facebook bear witness to the fact that there are more historical costumers, and more people interested in historical costuming, than ever. I ended up as one of the moderators of the Reenactment clothing and textiles group on Facebook because they get so many applicants. In addition, I have become concerned that Google will get rid of Blogger, as they have decommissioned G+ and so many other interesting and useful products, and that I will have to migrate my blog to another platform to keep it alive. But I still enjoy blogging, and am determined to continue to maintain an Internet presence. The last time I did an anniversary post, it was 2011. In that post, I included a token link to an actual costume-related article (since an anniversary post is technically a "meta" post). This link I found courtesy of Susan Baker Farmer on the Historic Tablet Weaving Group on Facebook. The article is about gene-modified bacteria that produce a spider silk so strong that space suits could be made from fabric woven out of it. The technique used doesn't produce very much silk, and doesn't produce it efficiently, but if it can be modified to produce at industrial levels it will have created something valuable and new indeed. Enjoy! P.S. The cape in the picture is made from spider silk, but not the kind reproduced with genetically-modified bacteria. I added it for visual interest, and because it's an interesting garment in its own right. togs_from_bogs_feed - Easter is Nigh. togs_from_bogs_feed - Here’s Your Digital Security Stuff Reminder. togs_from_bogs_feed - April Fool Funnies.